During the course of a conversation, speakers continuously shape their utterances in accordance with the knowledge state of the listeners. One way to do this is by prosodically highlighting important information (or focus). In order to master this linguistic skill, children not only need to assess the knowledge state of their listeners, they also need to know how such important information is to be prosodically marked in their language. The goal of this thesis is to determine whether and how the prosodic system a child is acquiring affects the acquisition of prosodic focus marking. The test cases are Dutch and (Central) Swedish. Whereas Swedish is a tonal language, where pitch is lexically distinctive, Dutch is not. In both languages pitch is used for marking focus, but in different ways; speakers of Dutch mark focus by means of a pitch accent, speakers of Swedish mark focus by means of a prominence-lending high tone (prominence H). Our initial hypothesis was that children learning a tonal language would be more sensitive to pitch contrasts than children learning a non-tonal language, possibly leading to an earlier mastery of prosodic focus marking in Swedish than in Dutch. 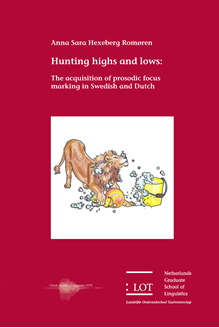 Our main finding is that the Swedish-speaking children indeed reach adult proficiency in the use of prominence H for focus earlier than Dutch-speaking children reach adult proficiency in the use of accentuation for the same purpose. Even if tonal sensitivity may explain these results, data from adult Dutch and Swedish suggest that other factors may also be in play, such as the amount of tonal variation in the system, as well as the reliability of the mapping between certain prosodic categories and focus.